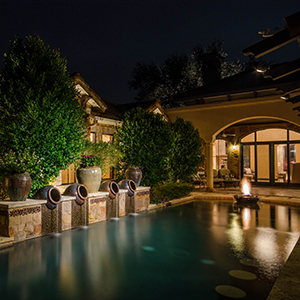 Down lights or moon lights can be used to illuminate many different applications in a landscape or hardscape project. ClaroLux has developed several LED landscape lighting fixtures that are ideal for moon lighting driveways, arbors, yard areas, play sets, putting greens, and other outdoor living areas. Whatever application you are trying to moon light, ClaroLux has the perfect luminaire for your outdoor lighting project. ClaroLux’s TL16-III Moon Lighting A Pool & Its Surroundings In Austin, TX. Add a touch of light to your outdoor living spaces with ClaroLux’s® TL16 LED MR16 Down Light. The Lattimore Down Light is proudly Made in the USA from high quality solid brass bar stock and pipe. The CL-TL16 Moon Light is designed with an adjustable 3.2″ extension shroud that minimizes glare and provides a soft down lighting effect for your outdoor living areas. The Lattimore also can be used with ClaroLux’s® 7″ extension visor if the standard 3.2″ visor is not long enough to prevent light glare. It is great for down lighting walkways other areas where other ground light fixtures are not suitable. The TL16 comes with a side mount hinged design for easy adjustment that can be locked into place with the two alan head screws on either side of the fixture. The one screw mount also makes installation a breeze on smaller surfaces. The TL16 accepts any Brilliance direct replacement MR16 LED which hosts a variety of lamp options. The ClaroLux® Lattimore Down Light is handcrafted and built to withstand the test of time all while looking beautiful. By fabricating the moon light fixture from solid brass, ClaroLux® has created a long-lasting product that develops an attractive appearance naturally over time. 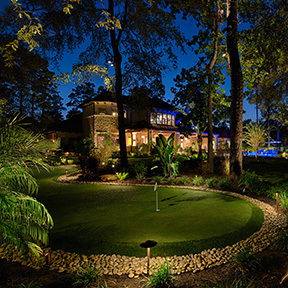 ClaroLux’s TL24-II Down Lighting A Houston, Texas Estate’s Putting Green. The TL24 tree light is ClaroLux’s premium down light. Both the Venice II Copper Tree Light and the Terni Antique Brass Tree Light are proudly Made in the USA from high quality, polished brass and copper. The CL-TL24 Tree Light is designed with a 7″ adjustable extenstion shroud that minimizes glare and provides a soft moonlighting effect for your outdoor areas. It is great for moonlighting driveways, walkways, and other areas where other ground light fixtures are not suitable. The TL24 is 100% water tight and designed to be aimed down. The TL24 surface mount is ideal for mounted to large trees and comes standard with 3 stainless steel anchor bolts to prevent the tree from growing into the fixture. The Venice II and Terni both are available with Brilliance direct replacement MR16 LEDs which hosts a variety of lamp options. The TL24 Tree Light are both handcrafted and built to withstand the test of time all while looking beautiful. By fabricating these fixtures from solid brass and copper, ClaroLux® has created a long-lasting product that develops an attractive appearance naturally over time. 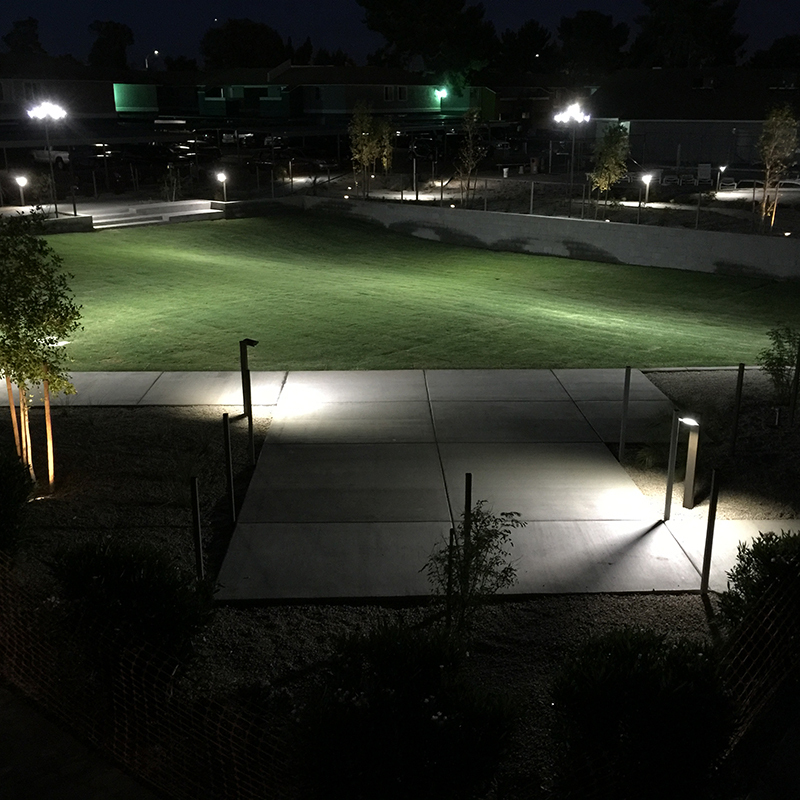 ClaroLux’s FL36-III Illuminating A Sports Complex In Phoenix, AZ. ClaroLux’s FL36 brass LED directional light is the perfect luminaire for illuminating large areas where ClaroLux’s TL16 and TL24 cannot. The FL36-III was designed not only as an up-light but also a down-light. The Lawndale is available with a removable shroud which secures the PAR36 LED and makes for an easy and fast installation. The FL36 fixture is often used on commercial spaces or recreational sport fields. It is compatiable with all of the Brilliance PAR36 LEDs. Brilliance LEDs are rated for 50,000 hours with minimal lumen degradation. Brilliance LED’s also come in a wide variety of wattages and beam spreads. The FL36 PAR36 brass directional is assembled with US and foreign components; all staining and assembly for the Lawndale takes place in ClaroLux’s manufacturing facility in Greensboro, NC, USA. The FL36 – Lawndale comes with ClaroLux’s exclusive lifetime warranty.